See also: Public Libraries; Library, State. Between 1886 and 1923, industrialist Andrew Carnegie and the Carnegie Corporation donated funds for more than 1,600 public library buildings in the United States. Ten of those libraries were constructed in North Carolina. Charlotte was the first North Carolina city to apply for Carnegie funds; its application for $25,000 was approved in 1901. Greensboro applied next, in 1902, and Winston-Salem (1903), Rutherford College (1907), Hendersonville (1911), Andrews (1914), Murphy (1916), Durham (1917), and Hickory (1917) followed. In 1915 Charlotte received an additional grant of $15,000 to add a children's room and an auditorium. After several false starts, Greensboro was given a second grant in 1922 to construct a branch for African Americans. Carnegie's generosity spurred the creation and institutionalization of public library service in many communities. However, most towns eventually outgrew their original Carnegie buildings. In North Carolina, the period after World War II saw an expansion of collections and services that forced many of the nine towns with Carnegie libraries to build new facilities. The Carnegie libraries in Andrews, Charlotte, and Rutherford College were torn down, as was the white Carnegie library in Greensboro. Greensboro's second Carnegie library is now part of the Bennett College campus. The Carnegie buildings in Durham, Hendersonville, Hickory, Murphy, and Winston-Salem still stand, but none is used as a library. Mary E. Anders, "The Contributions of the Carnegie Corporation and the General Education Board to Library Development in the Southeast" (M.A. thesis, UNC-Chapel Hill, 1950). George S. Bobinski, Carnegie Libraries: Their History and Impact on American Public Library Development (1969). Wendell W. Smiley, Library Development in North Carolina before 1930 (1971). Valentine, Patrick M. "Steel, Cotton, and Tobacco: Philanthropy and Public Libraries in North Carolina, 1900-1940." Libraries & Culture 31, No. 2, Spring 1996. 272-298. http://www.jstor.org/stable/10.2307/25548437. 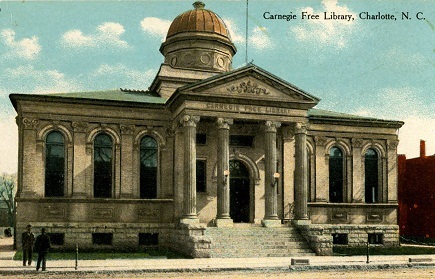 "Carnegie Free Library, Charlotte, N.C." Postcard. S. M. Kress and Co., circa 1910. http://digital.ncdcr.gov/u?/p249901coll36,1734. That's a great question without a single answer. The history of the State of North Carolina goes back to the early efforts to explore the territory and found a colony in the area that is now largely Virginia, North Carolina and South Carolina. In 1584 Sir Walter Raleigh received a patent from Queen Elizabeth I of England to found a colony. Philip Amadas and Arthur Barlowe were employed by Raleigh that year to explore the area. After favorable reports, Raleigh's cousin Sir Richard Grenville sent the first ship of colonists and supplies to Roanoke Island in 1585, although we know this attempt at colonization did not succeed. The permanent colony was later founded at Jamestown in 1607 and in 1663 and 1665 King Charles II of England granted charters for the founding and administration of the colony to 8 Lords Proprieters. Eventually the territory became three separate colonies, Virginia, North Carolina and South Carolina, and following the American Revolution, each entered the union as a separate state. I hope this helps and thanks for visiting NCpedia!